Spotliter (www.spotliter.com), a new mobile video camera app for the iPhone and iPod Touch, launches today, enabling users to apply sophisticated effects while videos are being recorded simply by tapping, pinching, swiping, or sliding fingers on the screen. Spotliter's touch effects and filters are unique, and not available on any other iPhone video recording app. Spotliter, for example, enables users to add a zoom feature (MAGNIFY) to a friend’s face in a video, or change a specific object from black & white to color (B&W2COLOR) while recording the actual video. Designed and developed by netomat, Inc., a pioneering company in mobile video and web technologies, Spotliter is the first video recording app built to take full advantage of the latest touch-enabled smartphones with chipsets capable of sophisticated video processing. 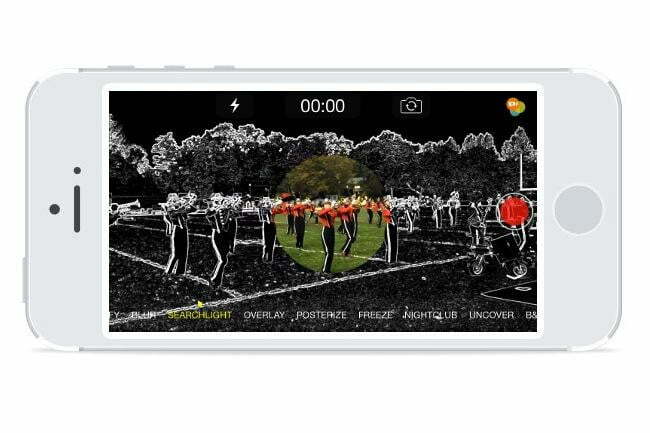 A new generation of interactive video effects, touch effects allow iPhone users to tap, slide or pinch their fingers on the camera screen to “spotlite” specific areas of the video being recorded. When users select an effect, a message briefly appears on the viewfinder telling them which touch actions can be used with that effect. Spotliter introduces 12 unique effects that enable users, with a simple touch, to record extraordinary, high-definition videos. These include Magnify, Freeze, B&W2Color and Searchlight, which were early favorites of beta users. · apply effects, switch effects, and switch between front and back cameras all while recording. The user can also pause, position the touch effect and restart recording to compose the perfect video. Use the hashtag #spotliter to share videos publicly so that Spotliter can discover and feature them on www.spotliter.com or atwww.facebook.com/Spotliter. Spotliter is optimized for the iPhone 5S, 5C, 5, 4S, 4 and the iPod Touch 3 and 4 and 5.